Hello friends... Hamne pichhale hi post me structured data errors ke bare me puri jankari de di thi. Structured data error kya hai ? Or kyu hote hain ? Iske kya nuksan hai ? In sabhi savalon ke jawab ham aapko pahle hi de chuke hain. Lekin is post me ham apko sabhi post ke structured data errors ko fix kaise kare. Iske bare batayenge. Friends jaisa ki ham bata chuke hain ki structured data errors ko do tarah se fix kiya jata hai. Ek me template edit kar ke schema.org HTML tag code ko edit karte hain. 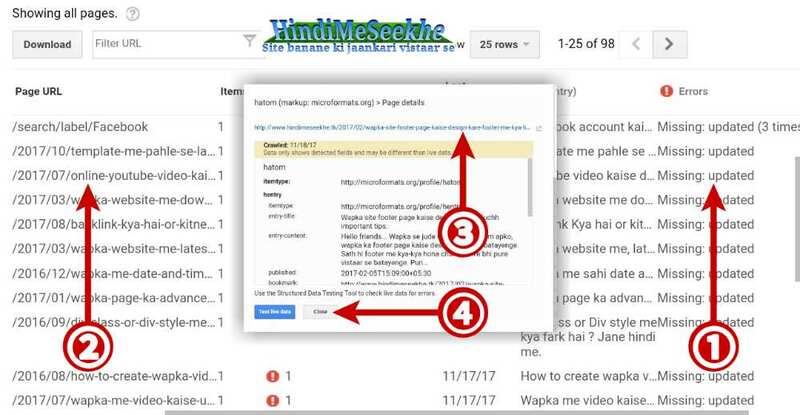 Kyunki structured data errors hone ka yahi mukhya karan hota hai. To ise edit kar ke, ham new posts ko errors se bacha lete hain. To template se structured data kaise fix kare post padhe. Lekin jin posts par errors aa chuke hain. Unhen fix karna bhul jate hain. 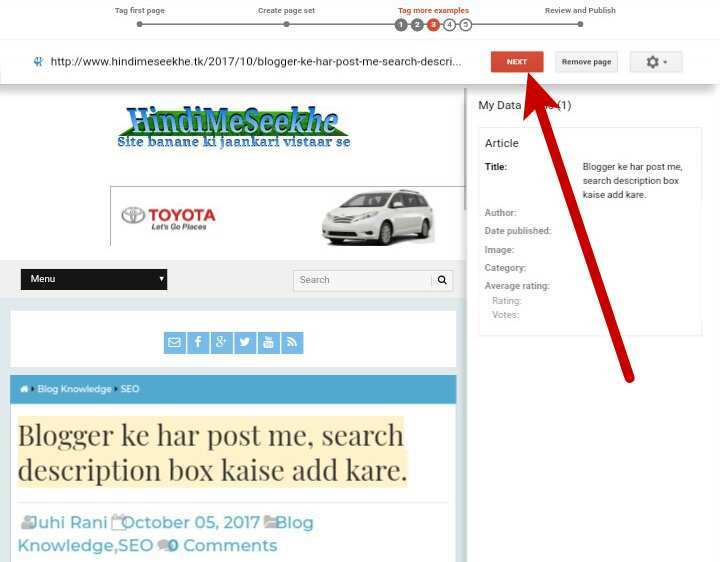 Jo ki hamare blog website ke liye sahi nahi hota. To is post me ham apko jo trick bata rahe hain. Us trick se ap sabhi post ke structured data errors fix kar payenge. To jayada der na lagate hue. Ham shuru karte hain. Google search console me preferred domain save kaise kare. Phone se Template upload kaise kare. Trick 1. 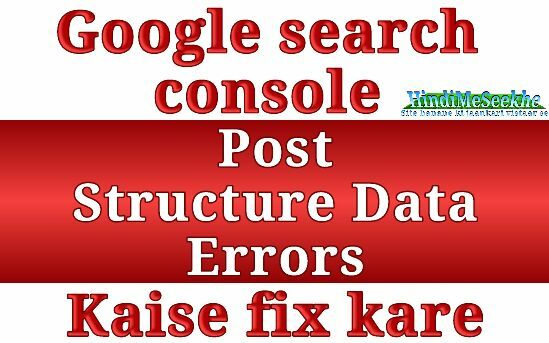 Google Search Console me structured data errors ko fix karne ke do options diye hue hain. Pahla Data Highlighter or dusra Structured Data Markup Helper. Data highlighter se ap Missing: Title, Author, Date published, Image, Category or Average rating jaise structured data errors fix kar sakte hain. 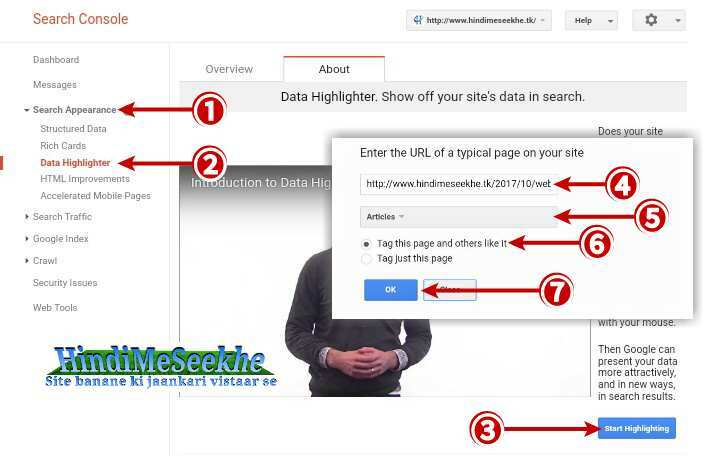 Structured Data Markup Helper ki help se ap Missing: Name, Author, Date published, Image, Article section, Article body, URL, Publisher or Aggregate rating jaise structure data errors fix karne ke trick pata chalta hai. Haalanki apka kaam sirf Data Highlighter se hi ho jata hai. But fir bhi hame har chij ki jaankari hona jaruri hai. To chaliye shuru karte hain. Structured Data Markup Helper ke bare me ham kisi or din aapko batayenge. Sabse pahle to ap google search console me jaiye. Or apni website select kijiye. Ab Markup: microformats.org par click kare. Aapko check karna hai ki error kis chij ka hai ? 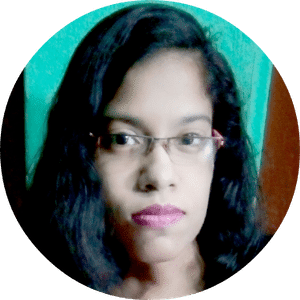 Jaise - missing updated, missing author. Ab us post ke URL par click kare. Ab post ka URL copy kijiye. Ab aapko search appearance me jana hai. Agar ap first time Data highlighter use karenge. To aisa hi page milega. Aapko Start Highlighting par click karna hai. Ab ek popup window khulegi. Khali box me aapko post url dalna hai. Yahan aapko Article select karna hai. Ya fir jo bhi post ka content ho. Jaise book, products etc. Yahan par aapko do options milenge. Tag this page and other like it, select karne ka matlab hai ki is post ke jaise errors or jitne bhi post par honge. Ap ek mehnat me un sabko fix kar payenge. Tag just this is page, select karne se ap kewal ek post ke error hi fix kar payenge. To ham Tag this page and other like it ko select karte hain. Apko jo sahuliyat lage. Ap vo select kijiye. Ab Ok par click kijiye. Ab aap aise page par aa jayenge. Uske baad kuchh options open honge. Usme title select kare. Fir Done par click kare. Jis tarah title select karne ke baad. Apne Title select kiya. Usi tarah se baki chijon ko bhi select kar ke, sahi tag lagana hai. Is tarike se sabhi error fix ho jayenge. Title select karne se, missing: entry-title or missing: updated errors fix hoga. Author select karne se, missing: author error fix kar sakte hain. Date published select karne se, ap missing: Date Modified error fix kar sakte hain. Image select karne se, A value for the image field is required error fix hota hai. Ye error tab hoti hai. Jab post me ek bhi image na ho. Category tab select kare. Jab kisi label par hi koi error aa jaye. Tab aapko is option ka istemal karna chahiye. Average Rating un blogs ke liye hain. Jahan par users ko rating dene ka bhi option hota hai. Par structured data me rating error show kare. Tab is option ka use karna chahiye. Ab ek popup window khulegi. Ab ap yahan par customise select kar sakte hain. Ise select kar ke, ap apna kafi samay bacha sakte hain. 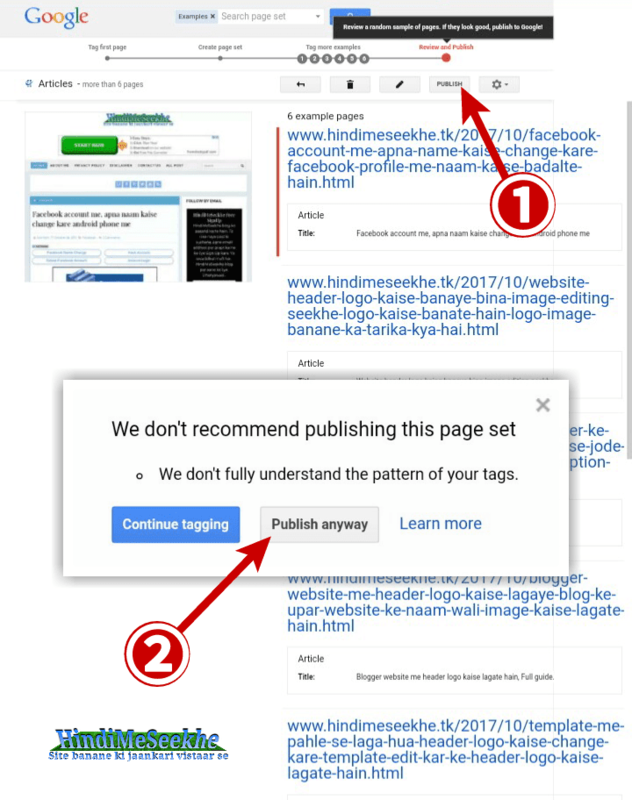 Yahan apko kitne pages par tag setting karni hai. Ye select kare. Jaise 6+ pages ya 24+ pages. 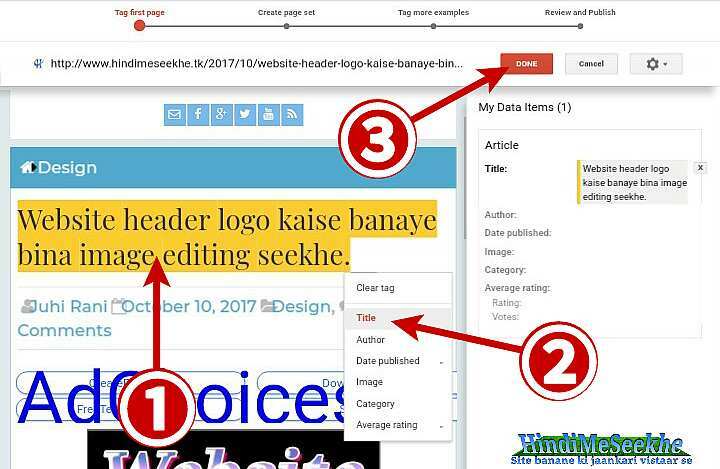 (Jyada pages select karne ka matlab jyada samay dena) isliye apne samay ke hisab se custom pages select kijiye. Yahan aap name likh sakte hain. 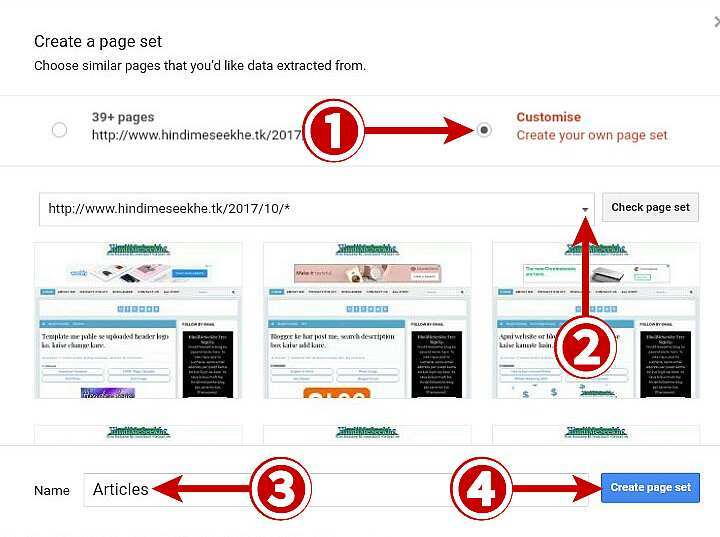 Ab Create page set par click kare. Ab apko bas Next par click karte jana hai. Agar aap pahli baar Data highlighter use kar rahe hain. To bich me aapko kuch options mil sakte hain. Agar aapko "More examples are required to learn the pattern of the site." aaye to "Continue reviewing" par click kar dijiye. Fir agar aapko "No further pages from this page set are available. Proceeding to final review." Aye to "Ok" par click kar dijiye. Ab last me aisa page aayega. Finish par click kijiye. Ab ek popup window open hogi. Ab Publish anyway par click kijiye. This is a great post mam. But ye karna ke baad kitne din lgte hain. Errors fix hone me? 3 mahine bhi lag sakte hain. 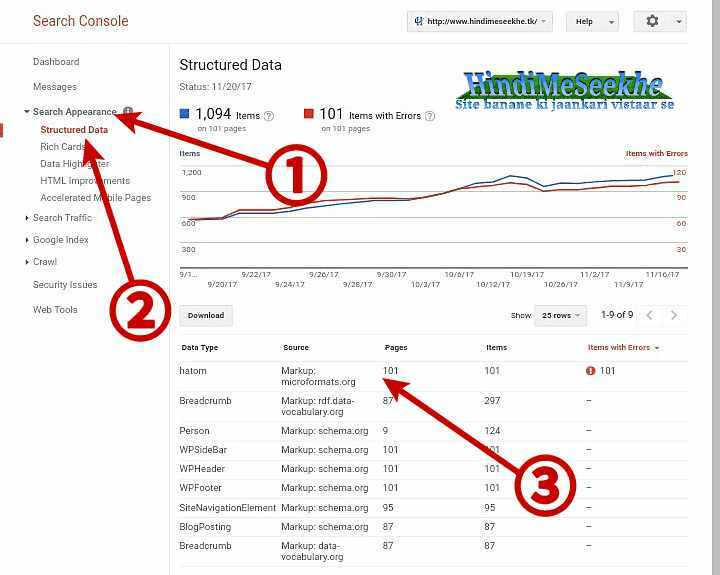 Ye search console par depend karta hai.